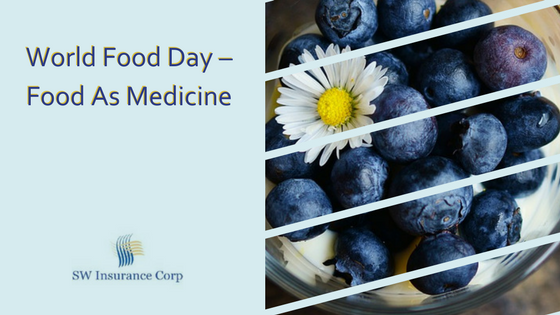 World Food Day – Food As Medicine | SW Insurance Corp.
October 16 was designated as World Food Day. The nations of the world have come together to designate this day to bring attention to the worldwide problems of “hunger, malnutrition, and poverty”. In the United States, “food security” is a major problem with almost 10% of American children having to deal with questions about where their next meal will come from. Part of the purpose of World Food Day is to raise money for various food charities worldwide. But another large component is food education. What should really be emphasized here is the close connection between food consumption and personal health. Obviously, if you are living in a famine-devastated area, your health will be negatively impacted. But even if you are in an area with plenty of food, the right food combinations can serve as medicine to keep you healthy. Maintaining a healthy lifestyle is one of the best ways to reduce illness, therefore resulting in less money you’re spending on healthcare. Here are some easy ways to start incorporating healthy foods into your diet. Perhaps the most obvious medicinal food is the fresh vegetable. Whenever possible, you should consume these vegetables raw or with as little preparation as possible. Cooking foods can sometimes remove their nutrients. In addition, try to get your vegetables fresh with little preservatives. Green vegetables are great sources of multiple vitamins and nutrients, but are also known to keep your body’s pH level balanced and can remove toxins from the blood. Additionally, they are low-calorie foods that can help satisfy your food cravings so that you eat less, allowing you to maintain a healthy weight. Eating raw vegetables also strengthens the inside of your mouth, including your teeth, gums and especially the roof of your mouth. This is important because as you age these areas may weaken and your teeth will become misaligned or even fall out. Many articles have been written that most disease in the body begins in the mouth, so take extra precautions by eating as many raw vegetables as you can. Also, be sure to have your teeth examined and cleaned every 6 months. Meat can have a place in a healthy diet, but it can also be misused. Often organs like the liver are discarded and not eaten. We should not waste food, especially these cuts of meat that are so healthy. Additionally, bones, skin, and ligaments can be used to create bone broth for cooking. These meats give us collagen and electrolytes and can help ease inflammatory diseases, which are one of the basis for many other physical ailments. Fish such as tuna, sardines, and salmon are great sources of omega-3s, also know as the good fats. These have been linked to easing inflammation as well as preventing cancer through helping cells heal themselves. These are just three of the ways that food can be used for medicinal purposes. A healthy diet is a critical part of leading a healthy lifestyle. By paying more attention to what you’re eating, you can improve your overall health. Not only will you feel better, you’ll find yourself spending less of your hard-earned money on the pricey healthcare that is often required when we don’t take care of ourselves. We encourage employers to bring in experts from your community to talk to your staff during their lunch hours. There are many nutritionists and dieticians that would be happy to give a 20 minute training.